My Grandfather passed almost exactly eight years ago, a few years after the passing of my Grandmother. They had lived on the same farm their whole married life – 64 years – although a few decades ago they built a new house steps from the old, drafty one, and knocked the old house down. Sixty-four years worth of living and six now adults kids’ worth of memories in that house. My cousins, who already had a houseful, were moving in. I helped my family try to organize the house and to make room for the cousins’ belongings. At the end of my time in Iowa, I had a small pile of treasures – some useful items and some keepsakes – that I loaded into a picnic basket and shipped home to myself. Plus I had a wedding ring that belonged to my Great Grandmother. I put the wedding ring on my ring finger, and it’s stayed there ever since. (Ironically, I’ve learned since that she and her husband were hoarders, with the sort of house you had to weave a path through!) The rest of the stuff was waiting for me when I got home. Without opening it, I put the picnic basket in the bottom of my closet, and there it sat – noticed but unopened – for eight years. Why? I’m not sure. I can’t claim I forgot about it: My closet isn’t deep, and it’s sitting right there, in front. At first, I was sad about the passing of two of my favorite people. Then I guess habit just took over, and the picnic basket sat and sat, until last week when Audra wanted to see what was inside. I confess: It was as much of a treasure hunt for me as it was for the girls. It occurred to me that on a very small scale, this picnic basket was a lot like some of those storage units that we discussed last week. I remembered that I had packed all the photos of my immediate family that I had come across, as well as letters from us that Grandma had saved. Here’s what else there was that I did not remember, at all: a pearl necklace, a plain woman’s watch that I do not remember my Grandmother wearing, a vinyl table cloth, a large piece of children’s fabric, a baby’s Baptism gown, two cafeteria style divided trays, a yellowed Yahtzee score pad, a bag of checkers, a piece of now molded embroidery, and a single plain cloth napkin. All I could think was: What in the world? I put the tablecloth, the cafeteria trays, and the watch straight into the thrift store box. I can imagine that eight years ago I thought these items could be useful (mat for under the baby’s highchair, toddler dinner plates, utilitarian time piece). The embroidery went into the trash, and the napkin joined the others in the cabinet. I washed the fabric for a project that I plan to do with the girls, although I’m mystified as to what I had originally imagined I would do with it. Whose Baptism gown is this? The pearls I put into my jewelry box, the checkers pieces went upstairs because Clara thought she’d lost a piece from our set, and I put the Yahtzee pad in our game box, although we’re certainly am not in danger of running out of score sheets. But why, I have to ask myself, were these the things that I thought I needed or wanted from my Grandparent’s house? Except for the photos, letters and Baptism gown, these items obviously weren’t saved as keepsakes; I thought they were useful and valuable. Time passed, I didn’t use them, and now they’re garage sale fodder. Next time you’re in a store, at a garage sale, or cleaning out a box that you’re struggling with, ask yourself, “If I’d not seen this item for 8 years, would I know the difference? Would I care? If I bought it today and put it away without using it, would I use it in a year or two when I got it back out?” They answer might be yes, but I think more likely, it will be no. 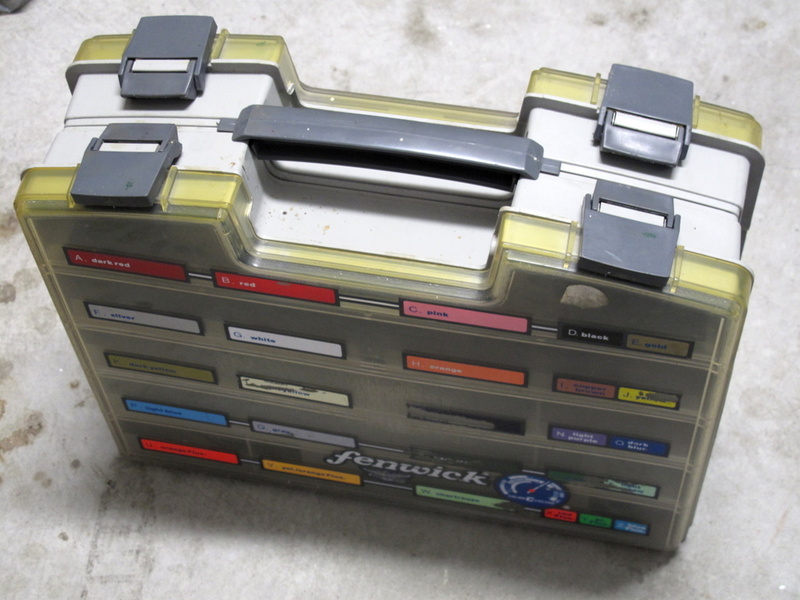 I picked up this fishing tackle box at a garage sale years ago in Seattle. It got used to store nuts and bolts and the like. Last week my husband was bored so he had a little garage clean up, emptied all the nut and bolts out of it and I sent the box to the thrift shop. Now I just have to figure out what to put the nuts and bolts in so I can take them to the thrift shop. Perhaps we should have sent it as a job lot. Oh well, live and learn. Once again I am grateful to my parents for being the kind of handy folk who fixed things rather than through them away and purchase a new one. I am thankful because they handed those skills down to me. Today I had to once again do a repair on my son’s backpack. Theres is another $50 I didn’t have to spend and another item saved from landfill. I like that saying and it reminds me of an ad jingle from years ago but the words escape me at this moment. It has the same sing song rhythm. First of all, congrats on limiting yourself to one basket at a very emotional time! It would have been easy to begin to grasp after more if you thought that somehow these material possessions of those you loved were going to be lost to you forever. It is so funny how that grasping, greedy desire for stuff can overcome us. It happened to me recently. My in-laws have had to leave their spacious house and move into an apartment in July. If only I had seen it coming. We live overseas but we were in the U.S. a whole year and saw that they were declining yet I did not remove the boxes I had in their crawl space. Basically because I had no place else to store the stuff. Through the years I have purged stuff from my little stash but it is still more than I would like to have. Most of it I don’t know what to do with and maybe you can help me figure that out in a moment. But a funny thing happend when I heard that they were selling the house and auctioning off everything. All of a sudden I had this desire to keep some of their stuff that really I have no use for. It was crazy. If I had been there I would have filled more than a picnic basket. I had to keep giving myself a mental wake-up slap. I didn’t need anything and didn’t want anything but there was this automatic greedy impulse to hold on to the past. Gracie, I’m amazed that someone in your family was willing to ship 20 boxes to you. That’s amazing! You managed to reduce to 10 boxes in a fairly short amount of time; that’s good work. In Austin there is a doll shop that will consign dolls. You probably wouldn’t get as much money for them than if you should them one at a time on Ebay, but it would be easier. Cindy, Yes, it was very generous of my bil to send me those 20 boxes. And what I thought was so sweet that he was actually very sensitve to the fact that we were not there to claim our stuff. It is easy to disregard someone else’s stuff. He actually saw a silver tray that I had received as an honor while at college and he saved it as it was being slated for the trash. Now honestly I had forgotten all about that tray and I am not sure what I will do with it now BUT the fact that someone would think about what might be valuable to another was very thoughtful indeed. He has endeared himself to me. Thanks for the idea about the consignment shop in TX. Some of the dolls are quite old, unusual, not to mention gorgeous, from all over the world. The handiwork on a couple I got in Rome when I was a little girl are just fabulous. They don’t make them like that any more. Any way I trust that I will find the right outlet. A fun thing happened with some of the dolls I had decided that I was not going to hold on to. They had belonged to one of my daughters and they were in good shape. I had slated them for the thrift store because that was the easiest thing and I did not have time to think about them further. Well my mother, who is the most generous woman I know, realized that those dolls would be really appreciated by 3 little girls who had just moved back to the U.S. from Uganda. So I was tickled to death that my mom not only helped them find a home but a home that I would have loved to have given them to myself if I had been aware of the situation. I think if we knew how much some of the stuff we hold on to could and would bless someone I think we would let it go a lot sooner. Grace, that’s fantastic. What a wonderful solution, and it was presented to you at just the right time. being detached from this situation personally all my mind is screaming out to me is that I am sure storing all that stuff in other peoples homes was convenient for you but imagine what a pain it must have been for them. Excuse me for being blunt but I am just writing my thoughts here. My own clutter was getting me down when I decided to start this mission and the items most frustrating in that lot was, and still is, the stuff that belongs to my daughter who lives away from home but hasn’t got the space to take it with her. I understand her situation but in truth that could change is she was willing to make a few sacrifices. But instead I am the one making the sacrifice cluttering up my garage and the spare bedroom with her stuff. When she is ready to accept it I will gladly fill my car and drive it to her at my expense just like your relative did mailing you your stuff at their expense even though they are already doing it tough right now. And like you in the end she will probably not want or need half of it. Colleen, I love that you are blunt. That is why I love and yes, need your blog! The way you deal with each of the problems I have been reading about is quite a blend of encouragement and straightforwardness. You are exactly right. I was rather embarrassed that others had to deal with my stuff and did so very sweetly and sacrificially. I think the thing that really bugs me is that I did not do anything about it when I could have. My fil re-did his basement for us so we would have a place to stay when we were back in the U.S. and then allowed us to store our stuff. It has been that way for 18 years! I have actually gone through stuff time and time again but I was never as ruthless as I should have been. (Because I only found you too late!) Thankfully the stuff in the apartment was not ours, so we did not have to deal with that. It was a convenient place to store stuff we could not take to Brazil. But convenience for me meant a cost for someone else. Thanks for your candidness. It is always appreciated. You point out also a great oversight on my part. (Please don’t gasp too loudly) I did not ask about reimbursement. At the time we were laying out money for college but I think it should be addressed sooner than later. don’t let it bug you buddy, consider it a lesson learned. Wisdom usually comes gently with age or rushed by tragedy so just be grateful that you have experienced it the first way and will know better in the future. Regret is as futile as procrastination so let it go. You know what it is never too late to reimburse so why not do that now as a gesture of gratitude and as penance for your past indiscretions then you can really let go of those regrets. Best wishes my friend and good luck with the decluttering wherever that needs to be. I am yet to experience this issue as I was much younger when I lost my grandparents and the stuff that was kept was not my choice. I do have some of my grandmothers things but mostly practical stuff and what wasn’t is now gone. Zann’s comment from the weekend is a very sad example of how the sudden loss of a young loved one can make it very hard to let go though. I am just glad that wasn’t my experience last year. I am very proud to say that even though I’ve been dealing with decluttering 3 entire households that have been squashed into 2 homes I’ve resisted getting any kind of storage units. I know if it goes to storage I’d never get around to dealing with it. I’d say probably about 50% of the stuff between the 3 households has already been donated or thrown away over this past year. Now I’m just beginning round two to go through all the stuff that was either already packed up or that I had packed away in the process for one reason or another the first time around. just keep your eye on the carrot at the end of the stick. Just imagine liberating those rooms and the feeling of freedom when all that space opens up around you. Martha – You’re wise to see it as a process. I don’t think it’s possible to consolidate and process that much stuff in one time through. Good luck and keep going! Love australia even more now my girl is over there! I need time later to read your recent post but it is now 4:35pm and I haven’t even started a post for tomorrow. I had better get my act together. I’ll check back later when I have completed all my duties, like posting, dinner etc. Pamela, I don’t envy your situation. It has occurred to me that if folks don’t diminish their supply of worldly goods before they pass, they literally become less able to do so when they’re older. There is absolutely no way my Grandfather could have physically or emotionally sorted through 64 years of belongings once my Grandmother passed. Pamela, I admire your perspective! sometimes I feel like a bit of a nag when it comes to this subject but your story like most others just goes to show it is important to make this point to people before it is too late for them to deal with. Yes sometimes the advice will fall on deaf ears but the thought will probably not occur to people without someone planting the seed in the first place. The phrase ~ I never thought of it that way before! ~ comes to mind right now. I bet you will keep your stuff under control after going through this situation and that is a good thing. I grew up on a farm. My parents lived there for all their married lives. My father died this spring, and my mother now has the HUGE task of trying to sort/discard/give away/organize all the material things that they acquired over the years. Having grown up during the Depression, it was hard for my parents to throw anything away. My father saved everything from bent nails to tiny pieces of baling twine, and my mother was equally thrifty in the house. We’ve been working up there off and on all summer, and haven’t even put a dent in the amount of stuff we have to deal with. I regularly declutter, and have done so for years, but this summer of trying to help my mother sort through their stuff has renewed in my mind my own determination to not leave a ton of stuff for my daughter to have to deal with when I am gone. If I remember right, Colleen dealt with this–clearing our clutter so our kids don’t have to deal with it–in a post not too long ago. I just went over to look at your declutter blog and I stumbled upon a post you wrote about my blog. You wrote some very nice things and I just wanted to say thank you for that. I then went on a search to see how long you have been commenting here and found what I think was your first comment back on the 18th of October last year. You have had about four of your own blogs since then. How is the collage supplies coming along, have they decreased since all those months ago. Sorry to hear about you dad. Your mom must have had a massive task to deal with once he was gone. I hope she has also decluttered her own stuff as well now that she realises how difficult it is for the person left behind to deal with the grief and the mess all at once. I hope she is coping OK. I will be doing another post on the subject of dealing with belongings after a loved one has passed on before too much longer. Youa re so right Becky. Farms seems to espcially attract a extra big heap of stuff. Stuff in the house, stuff in the machine shed, stuff in the barns. You don’t have an easy task ahead of you, but it sounds like your mother is a willing partner (?) which I hope makes it easier. An Auntie passed away; she was a pack-rat; I and other family members came to the ‘rescue’ to clean out her house and storage sheds. MOST of the stuff just was so old and rodent infected that it had to go to a dump (family heirlooms, photographs, old letters, linens, blankets, rotted wood furniture, at least about 100 boxes of games/puzzles, curtains in boxes, boxes of clothing, bags of tangled costume jewelry, etc). AWFUL!!!! Some of it we were able to ‘rescue’ and give to a thrift store (hundreds of skeins of yarn, kitchen pots/pans, serving utensils, ceramic figurines, pottery, picture frames, paintings, some books, etc). I vowed, after that experience TO NEVER PUT my husband, my own children or any other relatives or friends through that. Reading this post and others comments and stories, along with my own experience, only helps to reaffirm my belief in trying to live very simply and minimally. Truly this is just the tip of the ice berg for this topic. It appears we all have either experienced this first hand or know of someone or have heard of someone going through this (having to declutter an estate or a loved one’s house or etc, either while they are alive or after their death…). WE CAN VOW to make a difference for the future (continue to declutter as Colleen helps us daily; don’t put others through the pain and stink and horror of having to get rid of TONS of your stuff). Colleen, I truly look forward to reading more about this from you and Cindy and your readers. I think this is a HUGE challenge for SOOO many people (what to do with all the stuff??). Some ways it can be very positive. Some ways it puts such a downer on knowing how that person/persons were in their life (like they had secrets or something). It has taken me years to get over having to clean up my Auntie’s mess. I try to only remember her in her glorious times, which was usually when she traveled to see other family (we all live in different states). My dear Auntie NEVER invited us to her house….after her death, we figured out why. Oh Annabelle, What a sad story. I’m sorry that cleaning up after your Auntie has put a dark cast on your memory of her, although I can understand how that would be. You did a good job and a hard job, and I’m so sorry. yours is one in a long line of this type of story. In the case of your Aunt she obviously had a problem and that is sad but for others I think that they just don’t realise the situation they are leaving behind for someone else. People who say ~ I wish the house would just burn down while I am out and save me the bother of dealing with my stuff ~ are likely the ones who will leave it all for someone else to deal with. We are in the process of helping ma in law clean out her house (she has moved to a nursing home). We had a good day there today, reclaiming some things that we had given her, tucking a couple of things away for the children and bringing home a few things too, although thankfully not too many. She was getting quite agitated in the nursing home thinking about the ‘rubbish’ she had in the house but apart from the fact that she seems to have kept EVERYTHING (found a party invitation for my 60 year old husband when he was about 5!, his scout uniform from 1959!, and the invitation I gave her to our kitchen tea – 1974!) it wasn’t too bad. Sounds like your clean up is going well, although not fun, of course. My dear friend Dan was in the opposite position a few years ago. His mother, with whom he was not close, had junk galore – boxes and boxes of junky crafts, half completed projects, multiple pieces of furniture – and she repeatedly quizzed him on the safety and location of all of these objects. It was awful. Part of her dillusion was that she would be going home, and she wanted all her crap around her again. He wasn’t fully able to deal with her things until she died. 1. In some cases, placing too much importance on stuff and not being able to part with it leaves a person stuck between a rock and a hard place in the end. They can’t bear to part with it but at the same time they can’t bear the thought of leaving it to someone else to deal with. If one leaves it too late they become physically incapable of dealing with it and then that plays on their mind like in the case of your MIL. It can be a lose lose situation. 2. I think it is one thing to leave treasures behind that may be of some value to someone else whether that be sentimental or monetary but to leave behind a houseful of stuff that would mean very little to anyone including the person leaving it behind is a bit unfair in my book. That is why it is important to determine, before it is too late, what is worthy of keeping and what isn’t. And let us not forget that too late could be any time. One does not have to be old to die so if we get this under control and keep it under control then we can live with a happy conscience. I know at least one person in my life who has a house full of stuff that they love, but most of it is just trinkets bought at garage sales, there is a fine line between surrounding yourself with lovely stuff and cramming every nook and cranny with it. 3. I love that you are keeping a book with information about your treasures. Hopefully you are including information about what is valuable as well so it is easy for those left behind to sort the wheat from the chaff so to speak if they are not sentimentally attached to any of it. I hope also that you have informed those that you intend to leave your things to that you don’t expect them to keep it. I say that because they could very easily mistake the fact that these object are so important to you that you went to the trouble of keeping a book about them and they then feel obliged to keep them in your memory. Please make sure they all know your feelings about this. I am so inspired by your blog..I love love love the themes in each post! I hope to spend the next 365 days doing the same thing! :)! thank you so much for those lovely words and welcome to 365 Less Things. New readers seem to be coming to me thick and fast these days and I often wonder how they discovered my blog so please let me know how you came upon it. I hope that you will start your 365 day challenge because it is a leaning process you won’t forget and the result far outweighs the effort involved. Finding that thing a day soon becomes a fun challenge which then seems effortless. Start out with the easy things and in the process you will notice things that are potential clutter but you aren’t ready to deal with but as the process procedes you will find that when you revisit them you will have come to a point where decluttering them is now easy. That is how I have approached this challenge and I am sure the 365 seems a reasonable number at the time now I have reached about the 650 mark and am still going simply because I am ready to let go. In the meantime very little has come into the home that wasn’t replacing something that has worn out from regular use (the worn items I don’t count in the declutter because they are being replaced) so the house is getting more spacious all of the time. It is wonderful and I hope you can enjoy this feeling of freedom from clutter. Good luck and please continue to come here and share your journey with us. I found you on a minimalism blog list…can’t remember exactly where. I love your simple take on unloading one item each day. My goal this year was to get rid of 1,000 and I’m almost there! I especially like your gratitude section…that is something that I need to do. :)! Looking forward to following you! :)! This comment thread is so helpful, painful, familier, sad…….thank you for running it and thank you to all your contributers. I send condolences and love to everyone going through this process. I’d love to chat to everyone personally! And I absolutely agree that it can be turned into a positive and enriching and cathartic experience. Whether my relationship with my guy survives, phew, that’s a question! A friend clued me in on your blog. It really applies to me as well. Planning to go for this, but still needing to carve out time. I am currently caregiver to my father who loved me enough to declutter before he sold his home, despite he himself being caregiver to my mother. If I can only follow his example! I am so glad your friend so good enough to direct you to my blog. She is a good friend indeed if she feels she can do that without insulting you and you are a good friend in return. May I extend to you a warm welcome to 365 Less Things and hope that we are the inspiration you need to get started and succeed with your own declutter journey. Your father has set a good example for you and as you say it is now up to you to follow in his footsteps. The first thing you can do< and it actually saves time, is to stop bringing clutter into the home in the first place. Then just spent 10 minutes, everyone can find ten minutes, a day to find something, anything to declutter. Don't start by emptying and disrupting just start by deleting the obvious and work your way up from there. Good luck my friend and happy decluttering. Colleen – I feel like I am forum-stalking you at the moment! I cannot help but notice how many people struggle with clearing a deceased estate. And so many of us who are entering the phase of life when we realise that our parents and inlaws (all Depression babies and WW2 children who tend to hold onto everything) are going to land us with a titanic overwhelming job. It never occurred to me until my older friends started losing parents, and as I have been decluttering my home, which has been a lot of work, but is NOTHING on what my parents house is like. There is no way I can bring the subject up either. Can you think about doing a page, which possibly won’t be a forum, but a collection of the best suggestions under a heading with no comment field, so that those that suddenly find themselves having to decide what to do with Grandma’s sewing cupboard can scroll down and go “Aha!”. So if I could say to my siblings……hey, none of us sew, this stuff is good quality, Grandma was a generous person and would love to know it got used, so the suggestion here on this site is to donate to a sewing club/quilting club/High School sewing class/etc etc – who wants to make the phone calls? Food – pantry and freezer – often it isn’t feasible to cart it all across country, but what to do with it? Is there a local Food Bank or City Mission or Meals On Wheels, who would put it to use. From what I can gather, its coming up with the ideas to offload stuff quickly, and without dumping it (if its good stuff) that is hard, especially under such difficult circumstances and under a time limit. Then its just a matter of making phone calls to organise pick ups (most organisations will) or if need be arrange drop offs. I have a guide similar to what you are suggesting here. I add to it whenever someone gives me a new suggestion or if something pops up in a comment. I try to keep the suggestions broad because I can’t possibly add links to all the possibilities in all the countries of the world. Every place is so individual with so many unique options. Check out the guide and let me know if that was what you had in mind.